(0830hrs-1115hrs - Hutton Roof) Checking out my favourite epipactis schmalhausenii which is in 90% flower today and lies on pavement 5. It really has a (typical much bunched hybrid plume) just like it had last year. See photos of the full flower and another one showing its epichile and bosses. I did think that perhaps two nearby "new" plants (which were only about two metres away) where showing signs of becoming the hybrid, but not too sure now beginning to consider that they are the straightforward rare Dark Red Helliborines. Back down onto Pavement three and finished off doing the full survey of Dark Red Helliborines. Today I registered "68" full flowering plants compared to 148 last year. I have noticed this year there is a drop in number with the DRH and together with the fact that I am now only including full flower counts, this will also add to the reduction in numbers. Lots of immature (non flowering) plants are no longer considered in my counts. Although there are fewer, they do seem of a better quality this year, with some much larger specimens of 2ft and above, these I have made a special note of to try and include a return visit if possible. Also the colours this year appear to be better in a lot of the plants, they definately seem healthier specimens. Its still very early days yet, but think I may just have found another of the rare hybrids on pavement 3. It meets quite a lot of the criteria, with the circling flower heads, the sizes of epichile and bosses, and does have a greenish stem. But I cannot noticee a more amplexicaul on the basal leaves, plus the colour of the leaves are the "lemony" light green colour which you would expect with a straight forward "atrorubens" rather than what you would usually get with a "schmalhausenii". But I will be out and about again tomorrow so maybe I can draw a conclusion on this one. On the way up through the lower part of Burton Fell, it was nice being serenaded by the Redstart both on entry and exit. Lots of Ringlet Butterflies about, also Dark Green Fritillaries and Meadow Browns. Had my first Harebell flower today. 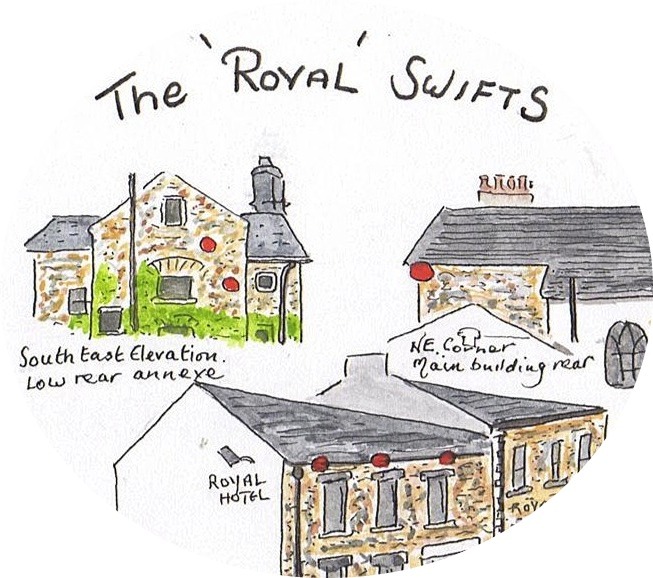 (Last night Thursday at 2145hrs - 2215hrs - Checking out the Swifts at the Royal Hotel). We had already established there was one nest on the lower elevation building at the front, but suprised to find out that there were two more also making a total of three on the front. Also we found another two on the rear annexe building. And yet another one to the NE corner of the rear main building, bringing a grand total to a possible 6 sites on the Royal. (Friday: 0830hrs-1130hrs) Checking out the Helliborines on Pavement 3 and 5. I am already getting the immpresion that maybe this year we are seeing fewer of the Dark Red Helliborine's, yet the ones on view seem to be in a better condition with some of them being much larger and stronger versions and some with such bright deep red wine colours. It really is heavy going on the pavements with this beautiful sunny weather, making it so tiring, yet at the same time so worthwhile. This year especially has been absolutely fabulous for the Tormentil and Wild Strawberries with record counts. Lots of the usual butterflies around eg: Ringlets, Dark Green Fritillaries, Small Pearl Bordered's. 0830hrs to 1130hrs. Checking Helliborines on both Pavement 5 and Pavement 3. First of all checking out the five E. Schmalhausenii and noticed that two of the plants have already had their flowers nibbled off. Yet it wasn't all bad news because I have found another two very close to Hybrid 1 (2 metres away - see photo across left) I am almost sure looking at the way the buds are placed plus other factors, that these also will turn out to be "E. Schmalhausenii". The main reason I was on this payment today, was that I had been asked to provide a up to date report about the progress of the other rare hybrid, the "Hypericum Perforatum Montanum" and thankfully so far the deer havn't got at them, although I am sure once they come into flower in about a weeks time, they then will be far more vunerable. This year we are down in number, with a group of 8 and two singles quite closeby. Moving on down to 3b for surveying helliborines, I passed through pavement 3 and was very suprised to find another fabulous "suspect" plant which I am going to keep my eye on (see photo). Along with several more Dark Red Helliborines which were all in flower and doing well. It does seem strange when all others on the other pavements are still in bud, yet exclusively on this particular pavement there is quite a large number already flowering. Finally arriving at Pavement 3b I managed to survey the full pavement and could at best only come up with 7 Dark Reds compared to 13 last year. Found 2 Broad Leaved compared to 1 last year. This is without doubt still the best pavement for "Mountain Melick". Also found a new colony of "Splendid St. John's Wort. Had first Grayling butterfly today on this pavement. Must have had about 30 Dark Green Fritillaries throughout the morning, scores and scores of Ringlets, odd Small Heath, but such a change not to have any Small Pearl Bordered Fritillaries. Having today parked up in Clawthorpe, as I was crossing over the fields I had a new Chiffchaff calling from the wooded area very near to Rowley Copse. Spent most of the morning and early afternoon checking out further Broad Leaved Helliborine and also E. Schmalhausenii. Sadly the very best 2012 photographic specimen of the rare hybrid on Pavement 9 has been completed bitten off right down to the basal leaves. 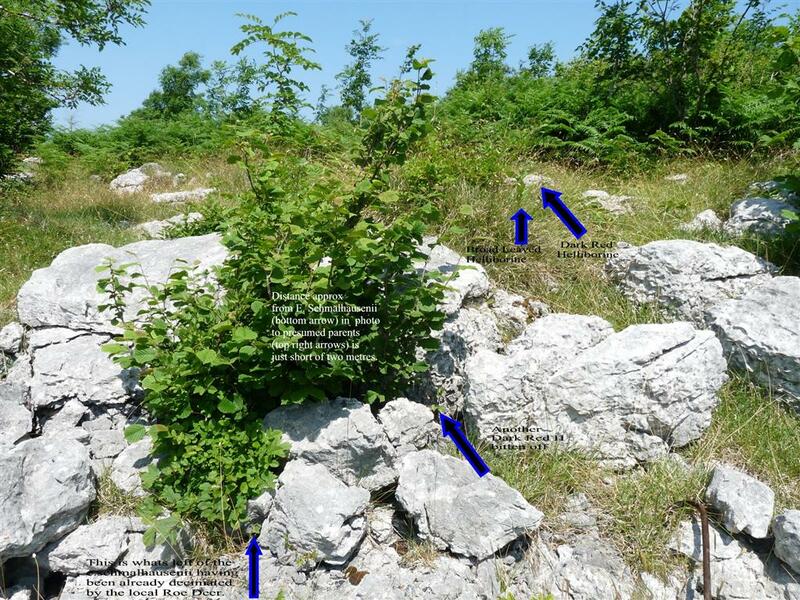 This one actually lies about two metre below a Broad Leaved Helliborine and a couple of Dark Red Helliborines (see photo on left - and click over to enlarge). And its right at the side of the footpath. Again the picture seems the same on this pavement also with lots more Broad Leaved Helliborines showing this year, but still lacking many of the Dark Reds at present, although the specimens that are already showing look like they will turn out nice plants. It will be another week before flowering at the earliest. Also found a couple of new clumps of the rare "Birds Foot Sedge" on this pavement. Also checked out the "purple variant" Broad Leaved Helliborines on Pavement 4 and this year the numbers have increased from 11 to 14 which is good and I would expect at least another 3-4 weeks before flowering with that magnificient "harebell" type colour. A very conservative count would be at least 100 "Ringlets" at least 50 Small Pearl Bordered Fritillaries of which some were very well worn. Also at least 20 Dark Green Fritillaries, along with numerous Small Heaths and Common Blues. Found a new area supporting "Common Rock Rose" although I have not as yet noticed any activity from the Northern Brown Argus. Mo the Chiffchaff was singing well. Lots of Swift activity along Main Street. Off out shortly surveying the helliborines on pavement 6 at Lancelot. 0900hrs to 1100hrs. Checking out Epipactis Schmalhausenii (see photo) up to three separate plants in full bud perhaps about seven to ten days away from flowering. Also the Dark Red Helliborines are doing OK and again one week away from flowering. The Broad Leaved Helliborines are about two weeks away. Also checked some Hypericum perforatum montanum. Up to twenty Ringlet Butterflies, along with several Dark Green Fritillaries, a couple of Pearl Bordered Fritillaries, several Common Blues. 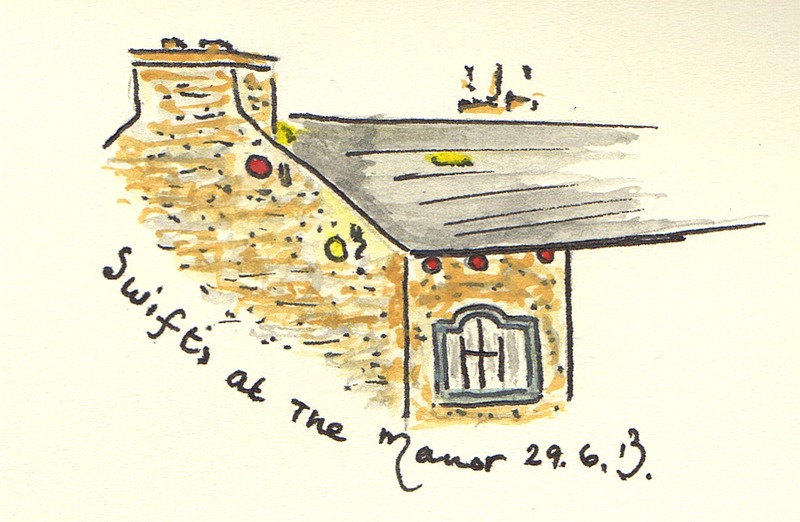 I can now confirm that a Swift was seen entering the "suspected" nest site on the North facing gable wall of the Manor. Also Chiffchaffs: Archie from Orchard Close and Mo from the bottom of Mowbray Drive were singing away this morning. Only counting the fully flowered Dark Red Helliborine specimens which now show with full drooping heads and so far up to 33 with only 50% of this pavement surveyed. Probably also another (50) which cannot be counted because they are only at stem or pre stage without any sign of flowers. Additional Broad Leaved Helliborines also this year, the count is now already up to 9 plants (last year only 4). Also noted that the rare Birds Foot Sedge (carex ornithopoda) is up 100% from last years 6 clumps to 12 Clumps this year. Also had my first Meadow Brown (LCS - Pave 6) and my first Ringlet Butterflies (DCrags). Also Small Heaths and Small Pearl Bordered Fritillaries were seen. Very misty at top of Dalton Crags. Did have several Tree Pipits calling. Checked out the "White" variant Wild Thyme and still doing well in the same place. Did a rough check on 6b and was pleasantly suprised to see the Dark Red Helliborines at about ten days away from best, which is just about the right date. I did have visions of them being behind this year. Still drooping heads at present but now well on their way. Also checked on the two Broad Leaved Helliborines on this pavement which again are very well advanced and probably will be about 3 to 4 weeks away yet. Found a new Broad leaved, which I could well have missed last year, if what I now suspect that maybe the deer had nibbled the top and as such would have not counted it. Also found some Flea Sedge and more Brittle Bladder Fern. 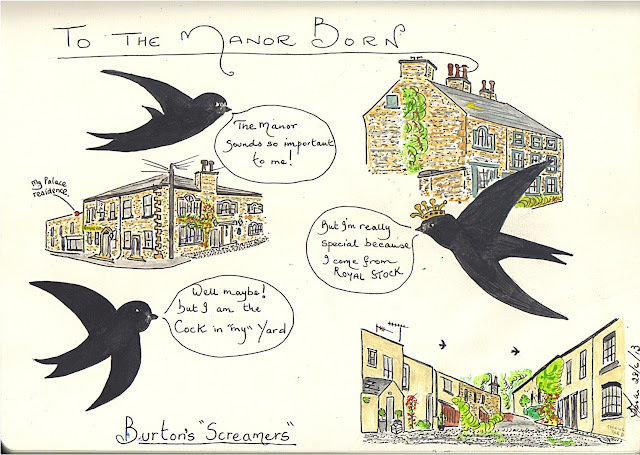 2130hrs to 2230hrs - Surveying Swifts in Cocking Yard, Burton In Kendal. 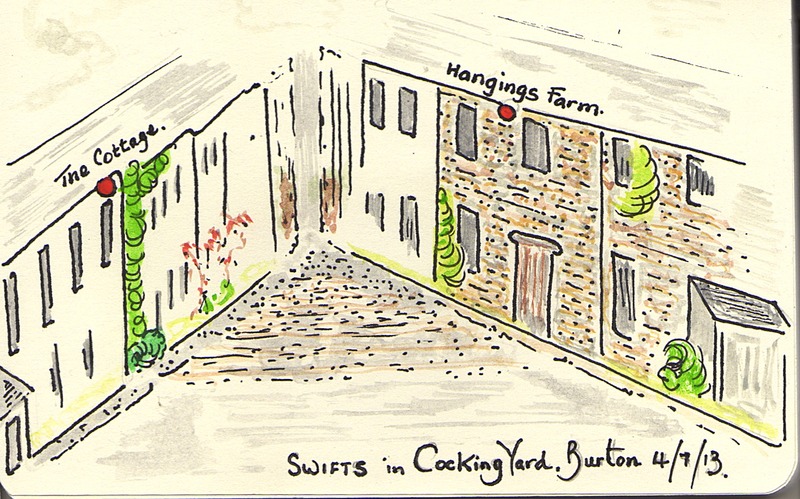 Continuing with the work of the "Swifts In The Community" the three (Reg, Jane and myself) of us decided to check out the swifts nesting in the Cocking Yard area of Burton. We were certainly not disappointed. We are now able to confirm that there are at least two separate nesting sites in the Yard. One on each side of the Yard. The birds on "Hanging Farm" appear to have chicks already, having been heard calling from the nest together with the very regular feeding patterns showing by the adult birds gives this presumption. The birds on the other side of the yard are also visiting their nest site at very regular intervals also, but maybe not just as regular. It was interesting to count a minimum of nineteen swifts high over the immediate area busy chasing and especially making their presence known with their regular "screaming" as they went about their business. Very difficult to count but certainly nineteen birds on two separate counts. Again it was also a pleasure to watch two (at least!) Pipistrelle Bats flying up and down and in and out of the yard, at times coming within what seemed only a yard or so away from our faces. 1000hrs-1115hrs. Surveying the Bee Orchids down at Carnforth. Did a rough count of the Bee Orchids in Carnforth which totalled 77 individual plants, quite spread out over a very large area, but the best concentration was about 26 plants in a radius of about 20 yards. For some reason this year the sloping banks only held 4 plants compared to 23 last year. The annual totals have been 2010: 1 plant, 2011: 18 plants, 2012: 87 plants and 2013: 77 plants. Also two lovely completely white variant Common Spotted Orchids. The Marsh Helliborines still need another three weeks. Also had a Chiffchaff calling along with lots of Goldfinches. 2115hrs to 2215hrs. Observing and surveying Swifts numbers on Main Street, Burton In Kendal. As part of the "Swifts In The Community" (A project based in North Lancashire and South Cumbria to preserve and enhance the traditional nesting sites of Swifts in our towns and villages). 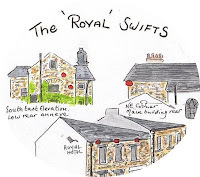 Reg, Jane and myself were checking out the local Swifts on the Main Street between 2115 hours and 2215 hours. We were able to establish that at least four separate individual birds entered "The Manor" at different points, 3 areas under the gutter/soffit boards on the front left hand West facing elevation, and one on the North facing gable end wall. Also it was suspect that another bird could well have entered the gable wall at a point lower down the wall. We were also very fortunate to observe a single Pipistrelle Bat which was very active. Although we did not have time to locate to the other two known breeding sites in Burton (The old Royal Pub and The Cocking Yard), it is intended to survey these over the next two weeks. Although perhaps it is far to early to be absolutely sure, we do now suspect that the 15 birds which left us last year, may well have all returned safely and are well into their respective breeding schedules. If anyone can help in the "Swifts In The Community" project either local in Burton and Holme, or even further afield you would be very welcome and may I suggest you contact the Project Co-ordinator Peter Moreton, who can be contacted by clicking here.